Chord 2Qute review | What Hi-Fi? What happens when you combine two Award-winning products into one? 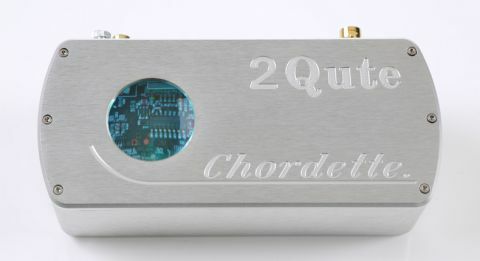 You get the brand new Chord 2Qute – a standalone DAC that’s the latest in Chord Electronics’ hugely successful Chordette range. The Chord 2Qute replaces the 2014 Award-winning Qute EX (£990), with upgraded specification taken from the class-leading Chord Hugo – yet another winner from last year. Chord claims that its use of bespoke, programmable chips enables it to get a better performance out of its DACs compared with rivals that use off-the-shelf solutions. In the 2Qute, Chord goes a step further by inserting the latest FPGA (field programmable gate array) technology – the one used in the exemplary £1400 Hugo – inside the compact Chordette chassis. This is a formidable combination, and it results in an incredibly organised and detailed musical performance, delivering an almost-effortlessly cohesive and musical sound no matter what song is played. Prince’s Love (in 16-bit/44.1kHz) sounds funky and punchy, with the DAC’s remarkable precision etching out every note with clarity and cohesion. It’s a snappy, fun sound that never lets the rhythm go flat. Stream Earth from the Gladiator soundtrack (in 16-bit/44.1kHz), and it’s clear the 2Qute outperforms the former Qute EX. The new 2Qute is just more definite with the way it delivers notes. It digs deeper to reveal even more layers of subtlety, and the sense of space is more open and grander than before, allowing the sparse composition to flow and set the sombre tone at its own pace. We also like how the 2Qute has a delicate touch with piano notes, even as the strings come in with a sense of gravitas. Switch up to a 24-bit/176kHz recording of Alison Krauss and Union Station’s Bright Sunny South and the twanging guitars are beautifully conveyed. Each pluck is taut, has rich layers of detail surrounding each strum, and almost feels tactile. The vocals are intimate and full of character and nuance. The 2Qute looks identical to its predecessors, with the build quality up to Chord’s usual high standards. The aluminium chassis is solid, beautifully machined, and comes in two finishes: silver or black. Despite its relatively petite dimensions, there’s a comfortable heft to it, and the rubber feet give it better grip, and keep surfaces scratch free. One of our favourite things about Chord products is the window into the chassis, which lets you peep into the circuitry. It changes colour depending on the sample rate being played, but it doesn’t really matter if you can’t remember what the colours represent – they just look fantastic. The 2Qute’s three digital inputs are the same ones found on the previous Qute EX. There’s a coaxial input and an asynchronous USB type-B input, both of which can play high-resolution audio files all the way up to 32-bit/384kHz. Meanwhile, the optical input supports up to 24-bit/192kHz files. Along with most popular file formats, all three digital inputs support DSD64. If you want to play DSD128, you’ll have to use either the coaxial or USB input. There’s also a single pair of line level outputs, through which you can connect the 2Qute DAC to your hi-fi separates. The only new addition to the back panel is a little switch that lets you click between the three inputs, which replaces the former auto-sensing feature. It’s a nice touch, although you’ll need to remember the inputs by their colour (also in the circuit window). The 2Qute is another success story for the Chordette range. The DAC’s unerring accuracy, insight and rhythmic drive are impressive, and it’s a joy to listen to. Pair it with the right components, and you’ll have a hi-fi system that delivers an admirable performance. We already want one.